One of the hardest things about English for those who learn it as a second language is that there are a lot of words that we don't spell phonetically. Spell check filters out a lot of mistakes - but it doesn't when the word you spell is an actual word which means something else. 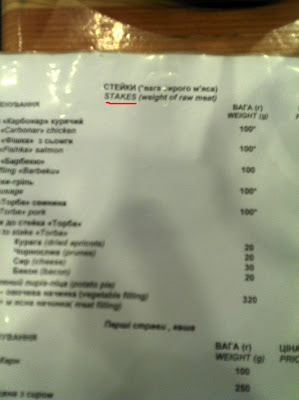 For example: at this restaurant in Ukraine, you can get a delicious "stake". I hope that is just a misspelling of steak and not a comment on the quality of their meat. If you aren't in the mood to eat a stake, you could always order some pancakes, AKA: "craps". 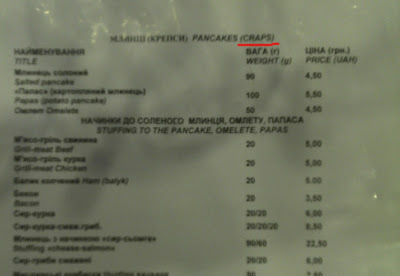 Again, I hope this is simply a misspelling of crêpes, and not a warning about what their pancakes taste like.